The wonderful Inn at Horseshoe Valley Resort is the best place for you to stay when training with SMART Programs. Please mention that you are participating in the YAMAHA program (for a discount) when booking rooms at the Inn. Or better still, you can click the following link to do your own booking online and get the Yamaha corporate discount: book your rooms at Carriage Ridge Resort and get the Yamaha or BMW discount . Many of our customers take advantage of the fantastic amenities right here at Horseshoe Resort. In addition to golf and skiing, we have great restaurants, tennis, tree-top Trekking, rock climbing and zip lining and many more activities. 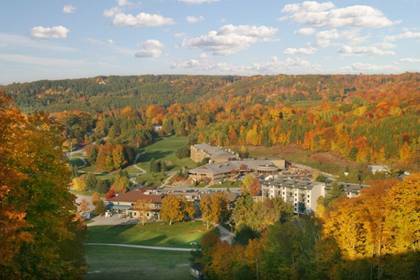 For a complete list of the amenities available to you at Horseshoe Valley Resort, please visit their website at Activities at Horseshoe Valley.